HOW CAN A STARTUP MAKE YOUR HOME EASIER TO USE? 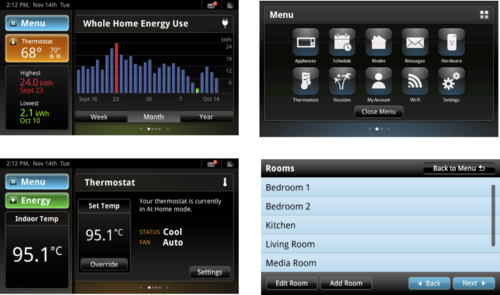 EnergyHub's initial product, a whole-home energy management system that could interact with HVAC, smart meters, and individual appliances, was one of TIME magazine's inventions of the year for 2009. But user feedback said that it was too technical and confusing. I joined the company in 2010, and as creative director, led design for an updated version of the product that would appeal to both homeowners and B2B partners. The EnergyHub whole home energy management product connects to smart meters, wireless programmable thermostats, and plugs and power strips to allow users to schedule their energy use and understand their energy costs. Working with Smart to realize the industrial design, we created the Home Base, an elegant touchscreen device with hard button controls for scheduling, and simple ways of communicating what customers most wanted to know - their costs. Engineering challenges meant that we couldn’t add new features if we were going to make our planned launch date. The new home screen, with a “speedometer” showing energy use and current costs, was a major experience improvement without adding features. New UI templates added consistent styles and button placement, increasing usability. We used color to differentiate between functions -- orange for heat, green for energy, blue for settings -- and keep the user oriented. The system also decreased the effort required to build new screens, and increased collaboration between the design and development teams. My team also created a mobile app that runs on Android and iOS, and web applications for our B2C customers and our B2B utility partners. The mobile app is simple: "a remote control for your home," as our CEO put it. The consumer web application is friendly and uses design cues from the device. The one for enterprise users is a highly functional dashboard that provides a quick overview of demand response programs and insight into customer behavior. The consumer web application allows users to understand their energy use, and to fine-tune their settings. Most importantly, the web application provides context. Charts provide glanceable summaries. Graphs are framed with simple questions like “How much electricity do you use?” This sort of simple language makes the world of kilowatts-per-hour more approachable for the average user. The consumer web application also had to be highly modular, to account for all the different sorts of homes and home energy systems our customers might have. I developed a highly modular wireframe system that allowed me to review every potential use case for a given functionality with our head of product management. The system also mapped to the way the developers divided up the work of implementing and QA did testing, and so the system created increased ease of collaboration for everyone involved. Promotional video created by my team, working with a freelance animator.